Gin is in – and with cruise lines eager to offer the latest artisan creations, now’s the time to enjoy the spirit of the age. For me, nothing beats sitting on deck of a balmy evening, gin-and-tonic in hand, as the sun slips over the horizon. As I write about gin and I’m a regular cruiser, this happy scenario is one I often enjoy. Unless, that is, the cruise line’s idea of a G&T involves budget spirit, limp lemon and sugary tonic from a tap. For years that was all too often the case. But we’re now in the middle of a gin explosion. In the UK, 100 new distilleries have opened in the past two years alone; exports are booming and sales increased by 16 per cent in 2016, topping £1 billion for the first time. Cruise lines are taking note, embracing the current trend for premium gin, specialist tonics and hand-crafted cocktails. Some are even launching their own labels. P&O was among the first, with a specialised gin menu in the Crow’s Nest bar on flagship Britannia. Here you can sample small-batch artisan gins such as Botanist Islay Dry, Tarquin’s Dry, Brecon Special Reserve, Two Birds London Dry and Silent Pool. The company has even introduced its own gin, named after founder Arthur Anderson. Distilled in Edinburgh, Anderson’s is made with botanicals such as coriander, kaffir lime, blood orange, fennel, star anise and Ceylon tea, all chosen to reflect current or historic P&O routes. Cocktails have been created to showcase the new brew, and the recommended serving is a double measure of Anderson’s with Fever Tree tonic and ice, garnished with a slice of pink grapefruit and cardamom seeds (£7.60). As senior vice president Paul Ludlow says, “This must-try gin experience will not only give a taste of far-flung destinations but will provide a real talking point for guests.” Having tasted it, I can only agree. Gin-lovers are also well catered for on Cunard’s post-refit Queen Victoria. I recommend heading straight for the Midships Lounge where the new Gin & Fizz menu can be found, featuring 40 different varieties including the strongest gin at sea, Pickering’s Navy Strength, weighing in at a mighty 57.1 per cent ABV (almost all the others are in the low 40s). Much care has gone into this menu, with the gins helpfully divided into different flavour profiles: Traditional, Juniper, Floral, Spice, Herbaceous, Citrus and Adventurous. The bar also stocks Seedlip, the first alcohol-free “spirit” to be distilled just like gin. With Fever Tree tonic, over ice, it’s almost as good as the real thing. 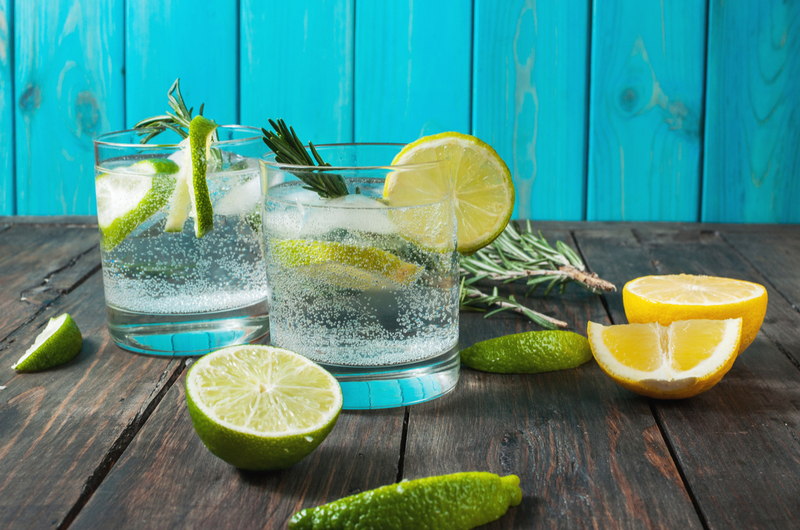 Gin & Fizz lists an amazing 13 different tonic waters, together with suggested gin pairings and garnishes (though what would go with the bizarrely named Peter Spanton Beverage no.4 Chocolate Tonic Water is anyone’s guess). If that weren’t enough to leave gin-fanciers tickled pink, Cunard also has its own label gin, distilled by Pickering’s. There is one spirit for each of the Cunard Queens, all featuring destination-themed botanicals: Mediterranean for Queen Victoria, the Orient for Queen Elizabeth and the Americas for Queen Mary 2. Sit at the curved, marble-topped bar, listen to live music and watch as your Victoria gin is poured into a Spanish copa glass from a spirit tap in the shape of a copper still. Then select from pots of herbs and garnishes to adorn your drink. But a word of warning for the indecisive: there are 13,500 possible combinations of G&T to choose from. Smaller cruise companies are also surfing the gin wave. Just over 20 years ago, the founders of Scotland’s Majestic Line, Dr Ken Grant and Andy Thoms, were horrified when a certain big-name gin brand reduced its strength from 40 per cent ABV to 37.5, in their opinion (and mine) ruining the product. So they set about producing their own, and the quaintly named Bilgewater is now the gin of choice for discerning drinkers on all Majestic sailings (cruising the coast of Scotland in a stylishly converted fishing boat while sipping Bilgewater is proving very popular indeed). Fred. Olsen has also put a lot of thought into the gin menu at its Marquee Bars, with 18 gins and six tonics on offer, including Hayman’s Sloe Gin, Williams Chase Seville Orange Gin, Bols Jonge gin from Holland, and the exotic-looking Pinkster Gin, which is flavoured with raspberries and black pepper. Or go French and try a G’Vine Floraison gin with Fever Tree Mediterranean Tonic garnished with white grapes. Delicious. It’s not only in the UK that the gin craze has taken hold. Germans are mad for it too, and Hapag Lloyd’s luxurious Europa 2 boasted arguably the first proper gin bar at sea. Formerly named the Herrenzimmer, the Collins bar (named in honour of the iconic gin cocktail Tom Collins) has a smart, clubby feel and offers a choice of 37 different gins. Try Monkey 47, a German gin with 47 botanicals that is a perennial favourite on board. Europa 2’s guests can enjoy free gin tastings and learn about the drink’s origins, ingredients and various incarnations. Five or six gins are sampled neat, with ice, with a suitable garnish and finally as a G&T. Europa 2 has recently been refurbished and we’re promised an even bigger selection of gins in the remodelled bar. Gin is also enjoying a lively renaissance in Australia, where there are dozens of small producers and hipster gin bars aplenty. Should you be heading Down Under and taking in a cruise as part of your holiday, check out The Bonded Store on P&O Australia’s new Pacific Explorer (formerly Dawn Princess): it’s a modern take on an old-fashioned cocktail bar, run in partnership with the Sydney-based Archie Rose Distilling Co, which makes its own gin. Gin-making master classes will be offered on board. Cheers!